Atlas Packs is a new company and they have created a good product. They’ve created backpacks that are extremely comfortable to wear and that carry a lot of weight without leaving you feeling fatigued. What’s more, they truly don’t look like technology backpacks that are full of expensive tools–they just look like a regular hiking backpack. Who’s This Camera Bag For? I love those pouches that come from the hip belt. Photo by Rachel Johnson. Atlas Packs would be perfect for anyone who needs to carry their camera equipment as well as other stuff because they are well designed and have plenty of room for coats and clothing and water bottles. I have traveled to many cities both flying and driving and using public transit, and I think this is the best traveling I’ve ever used. It feels safe because it doesn’t appear to be a tech bag, and it keeps gear padded and protected. This bag is made with a semi-rigid frame, as are outdoor industry backpacks. This allows it to carry weight exceptionally well by resting the load on the hip belt and keeping it lifted off of the shoulders. It also comes in sizes so that you buy the one that’s the right height for your torso. The shoulder straps are exceptionally comfortable. A remarkable feature is the set of pouches stowed in the hip belt on either side. These pouches are incredibly useful. I keep my active lenses in them so that it’s easy to change them quickly. I also keep my Platypod Ultra in one so I can stabilize my camera for long exposures and sharp photos without detaching my tripod from the pack. I think these pouches are totally innovative and I want them on every pack I ever wear. It’s also got a modular compartment system that allows you to either add more room to the camera compartment or enlarge the main compartment by simply folding a flap in or out. It’s a neat idea and I use it regularly. It’s also got a rain cover built in, which is a must when traveling. I have the Athlete model, and it’s comfortable to wear. I really wish I could explain it better, but when I’m using this bag I just don’t feel the weight of gear even though it’s thirty pounds on my back. I have only two suggestions for improvement. I want you to understand that I’ve used this bag for several trips, and I continue using it in spite of these two weaknesses. Firstly, the dividers in the camera compartment are too soft. They have a very nice feel and the velour covering is good, but the foam core is too flimsy and doesn’t do a great job of keeping heavier lenses in place. I’ve replaced it with dividers from other camera bags I own and I like it much more with stiffer sections. Secondly, the back panel doesn’t have the best circulation so my back becomes wet with sweat on hot days and doesn’t dry well when I’m wearing the pack. I’d like to see this improved, but even so, I love this bag. I think you know that I’d recommend this bag. It’s the kind of bag that is great for traveling with equipment, especially if you’re going to be carrying it a lot. In the video, I carried it several miles and it felt great the whole time. I take it hiking all the time and I enjoy traveling with it. It seems comparable to something like packs from Mindshift or F-Stop. I wouldn’t use it for family shoots or wedding shoots because it’s not as easy to get at the gear as a shoulder bag would be. But it’s perfect for carrying cameras and laptop and lots of other stuff. I think if I were backpacking across Europe, this is the bag I’d get. 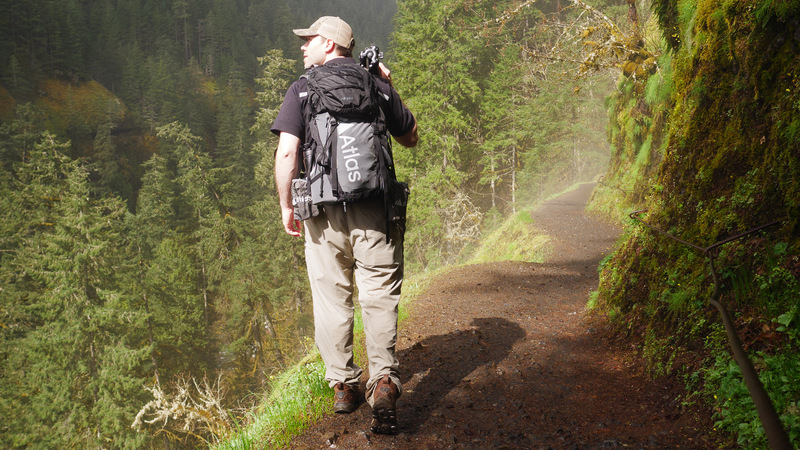 If you’re someone who likes traveling light or hiking and shooting on the go, then this is a pack you should consider. The Atlas Athlete is well made with reinforced stitching and high quality zippers and taped seams every where it counts. I expect many years of enjoyable use from this pack. Follow them at the Atlas Packs Instagram page to learn more.